The oldest shrine in Osaka, loved by locals for long time, was an imperial shrine of the first rank. Ikutama shrine「生國魂神社」, the oldest shrine in Osaka is located in the heart of the city. This fascinating shrine tells many stories about Osaka. The origins of Ikutama Shrine is believed that the Japan’s first emperor, Emperor Jinmu built Ikutama Shrine at where now Osaka castle is, when he moved to Osaka from Kyushu. It dates back to 5th century. Supposedly, this would make the shrine is the oldest in Osaka as Sumiyoshi-Taisha Shrine, one of the most famous and oldest shrine in Osaka was built by the wife of the 14th Emperor. When the warlord Toyotomi Hideyoshi came to power in 1585, Ikutama Shrine was moved to the current location in order to built his castle. The current shrine building was rebuilt in 1956. Ikutama Shrine was the first rank of the imperial shrine. It enshrines Ikutama-no-kami and Tarushima-no-kami which are mentioned in the Nihon Shoki or Kojiki, the oldest history book in Japan. These gods are enshrined at not many other shrines in Japan. There is only small information but one of the record indicated that “Yasoshima Matsuri”, a festival took place in Ikutama Shrine on the following year after the coronation a new emperor. A new emperor traveled all the way to Ikutama Shrine from wherever the current capital was. Once in Osaka, A new emperor was blessed by the several gods including Ikutama-no-kami, and Tarushima-no-kami. Unfortunately the Festival has stopped since 400 years ago, so no much information left. The honden, a main hall is built in the exclusive architecture called “ikutama zukuri”. It features a unique roof structure connecting 2 buildings. Ikutama Shrine has eleven small shrines to prominent deities lined up on the grounds, such as the Sumiyoshi gods or Sugawaru no Michizane. So you can pay your respects to many different gods, and be blessed by just visiting Ikutama Shrine. One of the small shrine is known as Yodo-dono Shrine because Hideyoshi’s wife, Yodo-dono, often visited this shrine during her life. There are also a number of monuments and statues on the grounds. Because the shrine is located in the central Osaka, many people have visited this shrine throughout the years and a lot of things have happened here as well. Some are famous and influential writers, and the others just happen to be native Osakans. Such as Yonezawa Hikohachi started “rakugo”, a Japanese style comedic storytelling in Ikutama shrine. Oda Sakunosuke, one of the most famous writers in Osaka, his masterpiece, “Meoto Zenzai” is so loved by Osakans. Access : 10-minute walk from Tanimachi 9-chome station on the subway Tanimachi line, or Uehonmachi station on the Kintetsu line. 20-30 minute walk along Sennichi-Mae street from Namba station. 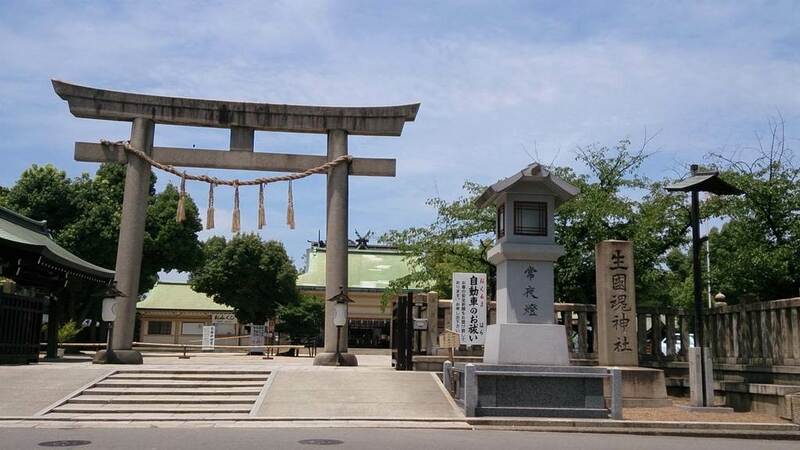 Ikutama Shrine is also famous for its annual summer festival on 11 and 12 of July. It’s one of the three major festivals in Osaka, among with Tenjin Matsuri and Sumiyoshi Sai Festival. Visitors can enjoy some performance in the shrine and various food stalls around the shrine. Shishimai, a lion dance and Mikoshi, portable shrine procession start in the evening. The festival’s main event is a procession of Makura Daiko drum with worshippers wearing red caps.